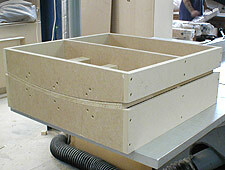 The desks shown here are constructed by securing NeatForm to a timber frame. First, the frame is assembled. 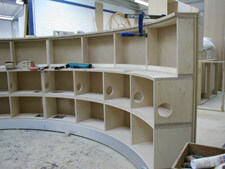 Here the construction is well advanced but the frame is visible above and below the shelf. NeatForm has been secured to the front and side of the desk. 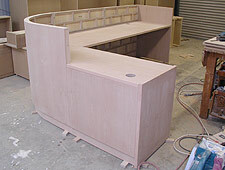 Here is a clearer view of the front of the desk and its NeatForm skin. The radius is a gentle 3 Metres or so. Another desk is seen from the receptionist’s side. 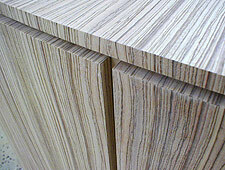 The grooves of the NeatForm are more visible and are vertical. 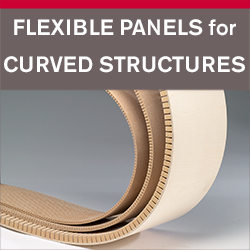 Cross-cut NeatForm is the material of choice. 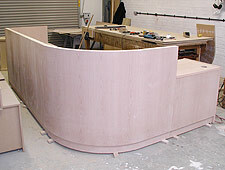 Laminated, pre-curved NeatForm was fixed to the panels of the front of this desk to decorate them. 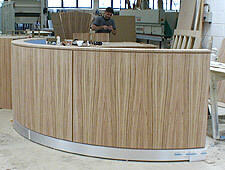 Two sheets of NeatForm were bonded together in a former to the same curvature as the front of the desk. This was done as a separate exercise (Photograph 7). Another view of desks decorated in this way. This is a close-up view of the top and decorated panels of the desk to show how they are related one to another. 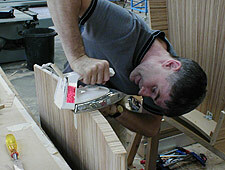 The former for these decorated panels is in action: two sheets of NeatForm are glued, grooves to grooves, and forced to assume the curves of the top and bottom parts of the former which are clamped together. 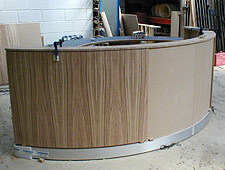 The decorative laminate is being applied to the curved NeatForm before it is put in its final position.